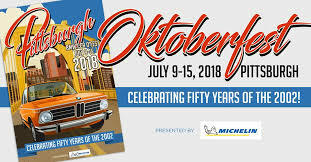 In 2018, Oktoberfest—the largest annual gathering of BMW Club members in the world—will be held during one of the country’s premiere automotive enthusiast events—the Pittsburgh Vintage Grand Prix (PVGP). The PVGP is a 10-day festival of races, car shows and automotive events which benefits Pittsburgh Vintage Grand Prix Charities. And, in 2018, the PVGP will celebrate BMW as its Marque of the Year. The BMW CCA will be handling all BMW registration for the 2018 PVGP and more information about the PVGP can be found at www.PVGP.org. The BMW CCA has been part of the PVGP since its inception over 35 years ago and we are excited to bring our annual gathering of BMW enthusiasts from all over the US to what has become one of the best motorsports events in the country. Oktoberfest will kick off on Monday, July 9, and will encompass all of the great social and driving events that members are accustomed to. All of these events will lead up to the famed vintage race weekend in Schenley park on Saturday and Sunday, July 14-15, where we will host the largest car corral and hospitality area at the grand prix. It’s also important to note that 2018 marks the 50th anniversary of the beloved 2002, which was the BMW model that ignited enthusiast’s passion for the brand in the US. This year, 2002 owners from across the country are set to meet up at O’Fest for what may be the largest gathering of ‘02s ever assembled.